You are currently browsing articles tagged Paris photos. Paris Notre Dame sunset in December, looking from the Right Bank of the Seine. See more photos. This photo of the Eiffel Tower taken from Montparnasse Tower observation deck captures the city in a beautiful orange glow. The skyscrapers in the background are located in the La Défense region of Paris at the extreme western edge of the city (accessible by RER A [red] stop Grande Arche/La Defense). Paris sunset by Coolbiere. A. The closet Metro station to la Tour Montparnasse (Montparnasse Tower) where this photo was taken from is Montparnasse Bienvenüe station on Paris Metro Lines 4, 6 12 and 13. The closest Metro station to the Eiffel Tower is Bir Hakeim on Metro Line 6. This photo of Notre Dame Cathedral with water reflection is taken from a tunnel along the Seine river. 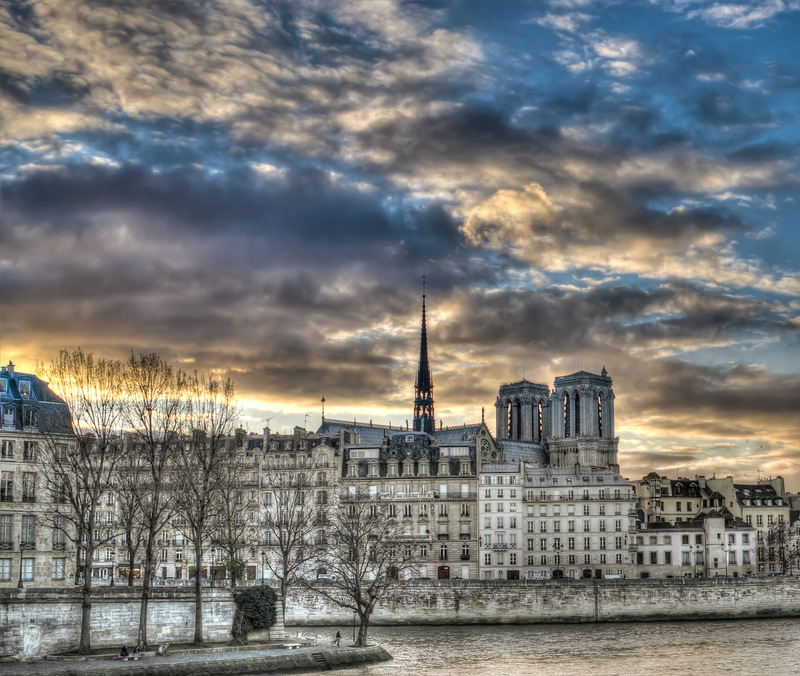 The closest Paris Metro stations to Notre Dame Cathedral are Cité & St-Michel on Metro Line 4 and St Michel/Notre Dame on RER C. St-Michel stations are on the left bank (south side) of the Seine river in Paris and give a view of Notre Dame much like in the photo. This photo of Paris La Defense was shot at dusk with long exposure showing streaking car lights taken from a pedestrian park in the median of Avenue Charles de Gaulle, located just east of Pont de Neuilly. 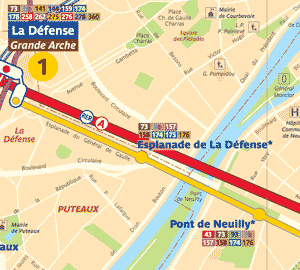 The closest Metro station is Pont de Neuilly on Metro Line 1. This aerial sunset photo of Paris capturing rain over the city and the Eiffel Tower is taken from the observation terrace on the roof of La Tour Montparnasse (Montparnasse Tower). Photo from rooftop of Montparnasse Tower of Paris city at sunset with rain and the Eiffel Tower. The closest Metro station to this viewpoint over Paris is Montparnasse Bienvenue on Paris Metro Line 6. This night time photo of the Sacré Coeur cathedral in Paris’ Montmartre area is Photoshopped with a starry sky background of our own Milky Way galaxy to make a stunning scene. 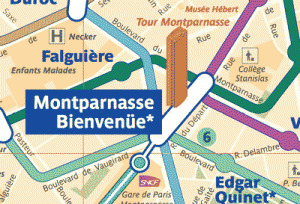 Montmartre’s touristic areas are accessible by Paris Metro Lines 2, 12 at stations Pigalle, Anvers (Metro Line 2) and Abbesses, Lamarck Caulaincourt (Metro Line 12). Fields of lavender in Provence area of (southern) France offer stunning colorful landscape views. Trains to Aix-en-Provence and Avignon from Paris leave daily with train fares as low as 35€ one way. This ceiling photo of Eglise de Cheylade (Cheylade Church) in Auvergne region of France, features 1386 uniquely designed & painted ceiling tiles, including motifs of animals, plants, flowers, fruits, angels, fleur-de-lys, bells, and a single human: a shepherd. Originally founded in 12th century, Cheylade Church was rebuilt in the 15th & 17th centuries to what you see today. Closest train to Cheylade Church arrives at Murat from Paris Austerlitz train station, roughly 5 hours 30 minutes travel time by train, with train tickets costing about 47€ one-way. Train service is provided Intercités and TER brands of France trains (non-TGV trains). This is an ocean sunrise photo of Etretat, Normandy, north coast of France. Trains from Paris to Etretat in Normandy (Le Havre closest station, 20km south of Etretat) leave from Paris Gare Saint-Lazare, departing every 1-2 hours, costing from 15 to 21.50€ and takes 2 hours 5 minutes to arrive via the Intercités brand of French train. Train reservations in advance will allow you to choose where you’re sitting on the train and may get you a slightly discounted price of the train ticket for this particular voyage. 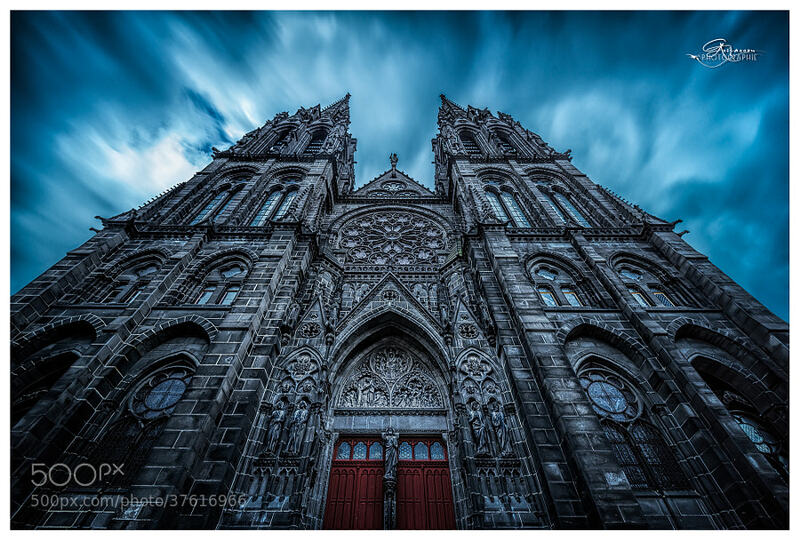 The Clermont-Ferrand Cathedral found in the Auvergne region of France (central south). Construction of the cathedral occurred over 600 years, with many starts and stops and changes during that time. Clermont-Ferrand is accessible from Paris by train on the Intercities brand of train departing from Paris Bercy station (walking distance from Gare de Lyon train station). Train tickets to Clermont-Ferrand, Auvergne, France are available from 37-50€ with travel time between 3 and 3.5 hours.